Looking back on the Virtual Boy, Shigeru Miyamoto sees the system as a successful venture. In the latest segment of Iwata Asks, a series where Mother/Earthbound creator Shigesato Itoi has currently been interviewing Nintendo CEO Satoru Iwata and longtime designer Shigeru Miyamoto, talk of the 3DS led to a reflection on the Virtual Boy. Though Nintendo's first attempt at a 3D system is generally considered a failure, Miyamoto sees the Virtual Boy in a different crimson light. Iwata admits the Virtual Boy was a "commercial failure," but also believes that it paved the way for the 3DS. Miyamoto, on the other hand, says that Nintendo's position as a game console manufacturer caused the Virtual Boy to be misunderstood, because he "thought of Virtual Boy as a fun toy." Miyamoto added: "It was the kind of toy to get you excited and make you think, 'This is what we can do now!'" 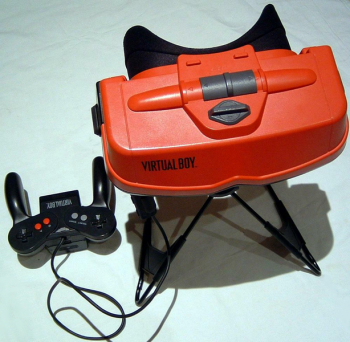 The Virtual Boy's name and the fact that it was created by Nintendo had people thinking it was the successor to the Game Boy, and even Nintendo was selling it "like the Famicom." This was a mistake in Miyamoto's eyes, because "as just a fun toy, it's a big success if you break just 50,000," he said. "It sales generated some buzz, and crossed 100,000, then 200,000, then 500,000-quite a good pattern ... [But] when you think of it as a gaming platform, it becomes a failure." Miyamoto didn't think it should be depicted as a game platform in advertising, but he didn't have the authority to change Nintendo's marketing scheme at the time. Miyamoto admits that the Virtual Boy wasn't as "cool" as the Famicom or NES, with players having to peer into a red tripod, but still feels it was a successful extension of other Nintendo side-projects like the Nintendo Love Tester and the Automatic Ultra Scope. However, when the Virtual Boy's approximately 700,000-800,000 sold is put up against Nintendo's other massive selling products, it doesn't appear to be as successful a device.